Mariner Software produces a number of products for Macintosh and Windows users. 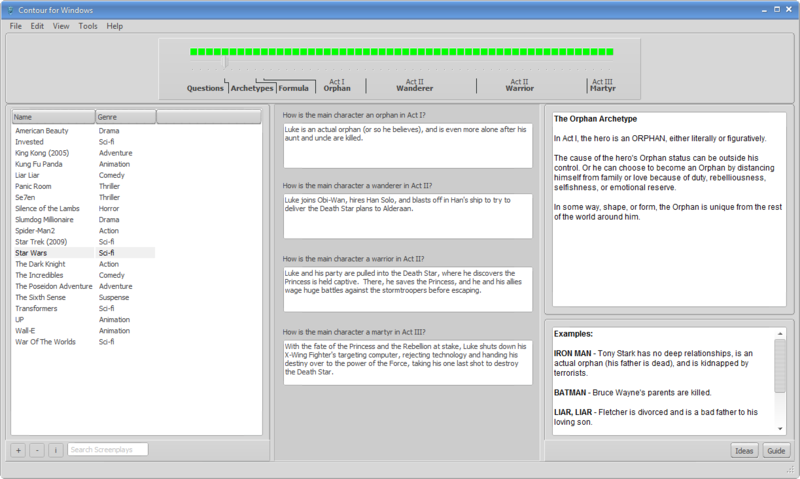 Contour is their Script Development or Story Development tool. It's based on the Joseph Campbell and Christopher Vogler work around mythic story structure. If you're not familiar with that structure, there are many good references (including Contour itself). The gist of it is that a character goes through four stages. We see them in their "ordinary" life at the start of the first act. This act ends with them thrust into a new world (metaphorically or physically) and faced with a dilemma. They become a metaphorical "orphan" at this point, unable to return to life before the dilemma. In the second act, the character begins as a "wanderer" and tries to find ways to overcome the problem they face. This usually goes badly and backs the character into a hypothetical corner. The character then goes on the offensive and becomes the "warrior" archetype. The story ends with the character becoming a metaphorical "martyr" (which can mean laying down their life or surrendering to a new way of thinking). Contour, at its heart, is a tool for walking the writer through the Campbell/Vogler story structure. 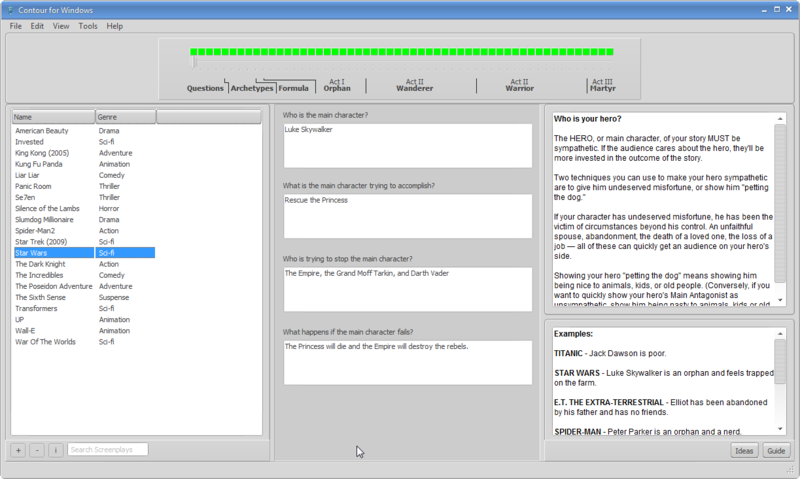 It includes a number of examples of well known movies, with Contour's prompts filled in for them. Examples built into the software include American Beauty, Kung Fu Panda, Silence of the Lambs, Star Wars, The Incredibles, The Sixth Sense, Up, and Wall-E. For the screenshots in this review, I'm using the Star Wars example. How Do You Use Contour? How is the main character a wanderer in Act II? How is the main character a warrior in Act II? How is the main character a martyr in Act III? “When a TYPE OF PERSON has/does/wants/gets A, he gets/does/tries/learns B, only to discover that C now happens; and he must respond by doing D."
When an orphaned farm boy discovers a message from a captured princess and the boy's family is killed by an evil Empire, he joins forces with a pair of droids, an old mystic, and a mercenary to deliver the plans contained in the message to the leaders of the rebel movement, on the way getting captured by a giant space station called the Death Star, only to discover that the Princess is also there and is slated for execution, so he must now mount a rescue of the Princess and fight his way out of the Death Star, and ultimately take part in a suicide mission against the space station that will rely on a miracle shot to save the life of the Princess and keep the Rebellion alive. You're then walked through the development of plot points and a central question for each Act in the story. Contour provides help for each plot point along the way, explaining what kinds of landmarks should happen, the kinds of things the characters are doing, etc. If, at any point in the story development process, you're not sure what they mean in prompts and help text, you can switch over to one of the examples provided from popular movies and see how the professionals filled in that section. 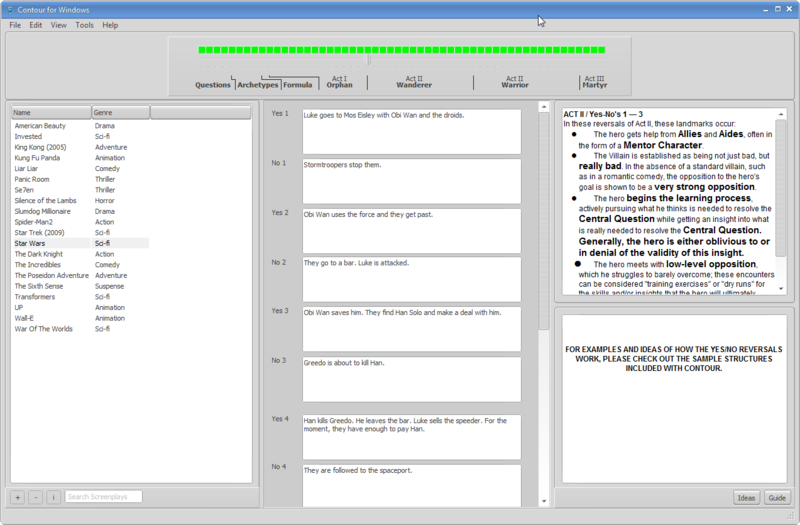 When you're finished, Contour will print out a file containing a Beat Sheet or Structure Report that provides the acts and plot points in the story. You can take this and use your favorite word processor or script-writing software to actually write your story or script. You cannot write the story inside Contour, only develop its structure. The file format used here is "Quick Report Format" or "QRF". I'm not familiar with it, but it seems to resemble a PDF format. Although there's no option for exporting the reports into other formats, you can print them. If you set your default printer to the "XPS Document Printer" you'll be able to store this virtual printout in a form you can read without the Contour software. If you're the sort of writer who eschews any mention of formula or structure, you'll probably hate Contour. Its job is to walk you through the classic three-act structure and it clearly uses the word "Formula" at one step in the process. As for me, I'm still enough of a novice writer that I find it helpful to have a tested, trusted structure to use a baseline. I'm willing to veer off that if I think it will improve the story, but simply having that structure to fall back on is helpful. If your situation is similar, you'll appreciate Contour. Contour differs from Ingermanson's Snowflake Pro software in that Snowflake is designed to get you to begin with a simple view of your story, then gradually flesh that out into a full-blown plot. Snowflake doesn't impose a particular story structure on you, doesn't suggest any plot points or scenes you might need, or adhere to any particular story structure or formula. If you're a writer who hates any mention of formula, Snowflake might be a better choice for you. Schafer's Power Structure software is something of a cross between all of these. Like Snowflake Pro, it's designed to help you get from a basic idea to a more well-fleshed-out story. Then, like Contour and Dramatica, you can develop plot points and scenes. 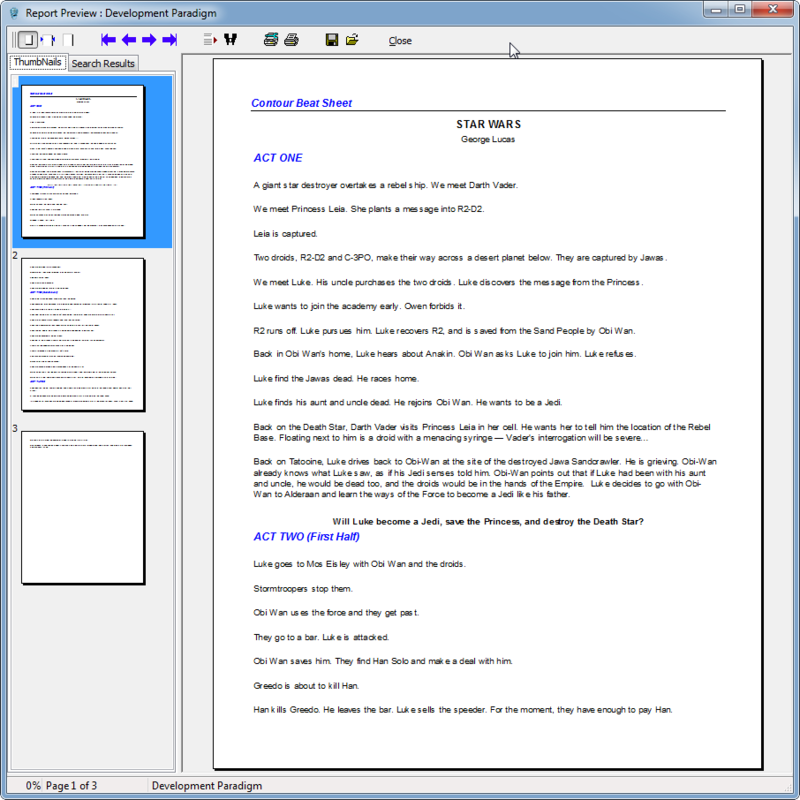 Power Structure also provides an Index Card view, a "Gestalt" view of the story, and even includes a full-screen word processor to write in. Unlike Contour, Power Structure supports a number of different story structure models, including the Campbell and Vogler model, Novel format, 2 and 5-act Stage Plays, Screenplays, and TV script structures. It's a pretty detailed and advanced story structure tool. Contour is a bit less complex. Until I've got more writing experience, I expect that I'll be using a combination of these packages and some old-fashioned brainstorming. I can imagine using Snowflake Pro to take the rough story idea and flesh it out into something more. 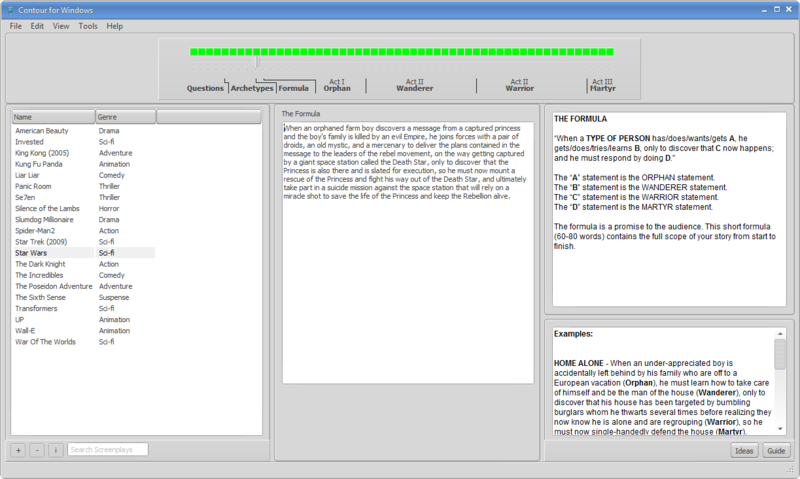 Then perhaps using Dramatica to layer on more complexity and make the story more complete. Then PowerStructure and Contour to really get detailed on the plot. If there are specific questions you'd like to see answered about Contour that aren't covered here, please post a comment and I'll see what I can do. Hey! This is a great article! You introduced me to some software I had never heard of before. This is great. With your analysis of Contour, I was wondering to what degree are we pigeonholed into following the struct it uses. Can we tweak it at all? Is there a way to make some adjustments? There's nothing in the user interface or in the manual that discusses customizing the structure used or the prompts displayed in the software, so I'd say there doesn't seem to be an opportunity to customize Contour's prompts. On the other hand, I don't think there's any reason you couldn't just use the parts you like and generate a report... then tweak that report content as you see fit. That's one thing that most of the packages I've looked at could probably benefit from... the ability to allow you to tweak the structure to suit your particular needs. I suspect that you might be able to "hack" Power Structure (a different product) to use different prompts but I haven't made any attempt to do that. Power Structure makes use of some kind of "template file" that contains the prompts it asks you. If you had a way to create or edit the template I would think it would ask different questions.